Do You Know What It Takes To Collect Disability Insurance Benefits? Established in 1979, we are a national disability insurance law firm that has helped thousands of disabled claimants throughout the U.S. to collect short and long term disability insurance benefits. Disability insurance companies have a reputation of denying, challenging and delaying disability benefit claims. Our goal as disability insurance lawyers is to do Whatever It Takes to collect disability insurance benefits for our clients. Wherever you live our lawyers can help you at any stage of a disability insurance claim. Call (800) 533-5718 or click here to schedule a free lawyer consultation. Whether its an Appeal (ERISA) or Lawsuit we have handled thousands of benefit claim denials against every major disability insurance company. We know the tactics of every company and our legal team takes a strategic approach on every case in order to give our clients the best possible chance to collect benefits. Most disability insurance denials require an ERISA Appeal to be filed before a lawsuit can be filed. Appeals are challenging as the same insurance company that denied the claim is the one reviewing the appeal. We win approximately 80% of our Appeals thereby avoiding the need to file a lawsuit. We have filed disability insurance lawsuits all over the country and have earned our national reputation through years of extensive litigation against the largest disability companies. When our law firm’s name appears on a client’s disability claim, everyone at every disability insurance company knows that we have the skill, experience and resources to fight aggressively for our clients. If your claim has been denied, contact any of our disability lawyers to discuss how we could assist you. The foundation of every short or long term disability insurance claim starts with the application for benefits. Claimants are often misled into believing that the process is as simple as completing a few forms and then benefits are paid. If you are reading this website then you are either aware or have been advised about the games that disability insurance companies play when it comes to approving disability benefits. At the application stage our lawyers walk our clients through each and every step of the process and we work closely with our client’s doctor(s) to make sure that our client’s medical support is appropriately documented. All communications with the insurance company are handled exclusively through our office and the insurance company is never permitted to speak with the client unless one of our lawyer’s is involved. The initial application for benefit forms are intentionally vague and designed by insurance companies to produce delays and denials of benefits claims. Treating doctors are often unfamiliar with the insurance company requirements and clients routinely end up with unnecessary claim denials. Every disability insurance policy is different and the policy language can not only be confusing, but subject to multiple interpretations. If you are considering applying for disability insurance benefits or have already applied, contact our disability lawyers for a free review of your policy and your claim. The approval of disability insurance benefits is only the beginning of the demands you will receive from your disability insurance company. It is usually incredibly stressful and annoying for a claimant to continually deal with their disability company. As you may already know, your disability insurance company will review your eligibility for benefits each and every month. You can never let your guard down when dealing with a disability insurance claim. Your company may require you to submit Claimant Statements and Attending Physician Statements either monthly, quarterly, semi-annually or annually in order to get paid. We offer an affordable monthly claim handling service in which our lawyers become the point of contact with your insurance company and it is our job to handle all aspects of your claim. Once we are involved the disability company is never permitted to contact you directly and all communications must come to our office exclusively. We assist you with the completion of claimant statements, doctor statements and we regularly review your medical records to make sure your doctor is providing appropriate medical support in order to continue benefits. We know exactly what disability companies are looking for in order to deny a claim and our job is to keep your payment of benefits continuing without any interruption. Contact us for a free review of your disability claim and to learn how we can assist you. There are many claimants that would rather have a one time lump sum payment than receive payments on an ongoing monthly basis. A disability insurance company is not required to make a lump sum offer, but there are a few disability insurance companies that will consider a buyout on claims that make certain criteria. Our disability lawyers have negotiated and obtained hundreds of lump-sum settlements with companies such as UNUM, CIGNA, HARTFORD, TRUSTMARK, PRUDENTIAL, METLIFE, SUNLIFE and numerous other companies. If you are considering a buyout or have received an offer, contact us for a free consultation to discuss your options. Download our free ebook Whatever It Takes to learn more about our law firm and the process of winning your claim for disability insurance benefits. Disability insurance companies are notorious for challenging, delaying and denying claims. Since 1979, our clients have collected over $400,000,000 from insurance companies. We only represent claimants – never insurance companies - and we have the skills, talent, nationwide reputation, and financial resources to go up against any insurance company.We believe you can evaluate our level of experience by reviewing our hundreds of client testimonials, resolved case summaries, 200+ original disability videos, publications, media appearances and industry awards. Call (800) 533-5718 or click here to schedule a free lawyer consultation. Two disability attorneys and one paralegal are assigned to every case. Long term disability claims are complex and we want clients to have the benefit of counsel from several of our disability attorneys. We have established a national network of doctors, nurses, vocational consultants and lawyers in order to put our client's claim in the best position for claim approval. Our law firm is comprised of 40 team members (15 lawyers) and it is managed by Attorney Gregory Dell. Our disability division has been recognized by U.S. News and World as a "Best Law Firm" in the area of insurance law. Since 2006, Mr. Dell and his lawyers have been authors of a text book on disability insurance law which is used by other lawyers and judgesas an authoritative source. Since 2011, Mr. Dell has been appointed the Vice-Chairperson of the American Bar Association Health and Disability Insurance law committee. Mr. Dell has received the highest ratings from the leading lawyer peer review rating services. Mr. Dell is regularly invited to lecture at national disability insurance conferences, continuing education seminars for lawyers, law schools, and medical conferences on the topic of disability insurance claims. He has been quoted in the national media on topics of disability insurance, published numerous articles in national publications and has appeared on numerous national radio shows to discuss disability insurance claims. Mr. Dell and his team have litigated claims against every major disability insurance company and we are one of the few law firms to ever prosecute a national class action lawsuit against one of the world's largest group disability insurance companies. Our main website diattorney.com (1,500+ pages) and YouTube channel are viewed by more than 60,000 unique visitors each month, which makes our law-firm the unofficial real-time leading resource for disability insurance claim information. Our blog contains over 5,000 comments and questions which our lawyers respond to on a daily basis. Through our extensive daily interaction with disability insurance companies and claimants nationwide, our lawyers are constantly aware of the claim handling tactics used by every disability company. We have the expertise to back up our Whatever It Takes to collect benefits for each and every client. Call (800) 533-5718 or click here to schedule a free lawyer consultation. Obtaining and maintaining approval of disability benefits on an ongoing basis requires strategic planning. From the moment you file for disability benefits, the insurance company is immediately calculating a predetermined statistical duration after which you should be able to "return to work" based on your sickness or injury. This strategy is nothing more thanthe company's attempt to either deny benefits or stop paying as soon as possible. Our firm relies on our experience of litigating claim denials and dissecting the internal claims handling processes of disability insurance companies to strengthen and protect our client's claim. Through either litigation or ongoing claims handling, our attorneys are dealing with every major disability company on a daily basis. We anticipate all their tactics and have firsthand knowledge of their internal claims handling processes. This knowledge allows us to immediately identify any potential weakness in a disability claim and then advise our clients of a plan that must be followed in order to obtain the evidence necessary to satisfy the disability insurance company's ongoing requirements. Call (800) 533-5718 or click here to schedule a free lawyer consultation. A claim for disability insurance benefits will never be approved without the support of at least one treating physician. "Physician Support" means that your doctor will certify and document that you have restrictions and limitations that prevent you from working in either your occupation or any occupation. It is essential that your treating doctor properly documentyour medical records with your disabling conditions. Most doctors don't have the time to generate detailed medical records and the insurance companies will routinely deny claims based upon insufficient support in a claimant's medical records. Our attorneys constantly review your medical records and work with you and your treating physicians to obtain appropriate medical documentation in support of your disability. Call (800) 533-5718 or click here to schedule a free lawyer consultation. Disability insurance companies are fickle. An approval of benefits today does not mean that benefits won't be denied tomorrow. Disability carriers continuously bombard claimants with requests for claimant's statements, attending physician statements, medical records and financial documents such as tax returns. The disability company employees evaluatea claimant's eligibility for benefits on a monthly basis and they are trained to look for any inconsistencies or lack of information as a basis for claim denial. Due to the complex language in most disability policies, claimants are often confused about the things they can or cannot do in order to continue receiving benefits. Whether it's a claim denial, application, or continuance of claim, it is our job to protect our client's monthly benefits and prevent the insurance company from wrongfully denying or delaying benefits. Call (800) 533-5718 or click here to schedule a free lawyer consultation. Disability insurance companies have billions of dollars, but over the years, we have developed our own resources and learned to fight fire with fire. Beyond our exeprienced attorneys, our resources include medical doctors, psychologists, nurses, therapists, accountants, vocational rehabilitation experts, former disability insurance company employeesand other insurance industry experts. We have represented disability claimants in every state and established a team of experienced disability attorneys throughout the country. In the event of a claim denial, we are prepared to immediately file a lawsuit in any state or federal court. Our nationwide reach is enhanced by our use of new technology and new media to communicate with speed and efficiency. The Internet and email have changed the way law firms work - allowing our disability attorneys to see a client's entire file from any location. We have found that 99% of our clients prefer to communicate via telephone, email, fax, Skype or GoToMeeting sessions - and they enjoy using our website, blog and Facebook page as other valuable, informative resources. Our commitment to service is old-fashioned, but our information is up-to-date and our use of technology is cutting edge. Call (800) 533-5718 or click here to schedule a free lawyer consultation. On a daily basis, we monitor the claims handling actions of major disability insurance companies. We track every lawsuit filed and every court decision issued nationwide. We report and share this valuable information on our website by maintaining pages discussing each disability insurance company. We have created an online forum in whichdisability claimants nationwide can post comments or complaints about their disability company on our website. Click here to learn more and watch our videos about your disability insurance company. Our constant work with disability claimants allows us to anticipate and protect our clients from unreasonable claim denials. Call (800) 533-5718 or click here to schedule a free lawyer consultation. For any claimant, it is essential to prove that your medical condition is preventing you from performing your job or any gainful occupation. Therefore, it is important that the law firm you hire to represent you fully understands your medical condition. Up-to-date knowledge requires constant vigilance given the rapid changes in the field of medicine. Our firmcontinuously monitors the latest medical research on disabling conditions as well as the latest disability benefit cases involving the major disabling conditions. Call (800) 533-5718 or click here to schedule a free lawyer consultation. The compassion we feel for your physical, emotional, and financial pain drives the passion we bring to the fight to secure your benefits. We know that the inability to work combined with delays and denials by insurance companies create financial hardships for individuals who are already struggling to cope with the pain of the injury or medical condition that stopped them from working in the first place. We also know that the financial hardship may not be limited to the claimants alone: manyclaimants are breadwinners, fathers, mothers, grandparents and caregivers - in other words, human beings whose medical and financial condition impacts the lives of loved ones. The attorneys of Dell & Schaefer work with disability claimants every day. Call (800) 533-5718 or click here to schedule a free lawyer consultation. The fact is, it not only takes all the qualifications described throughout these pages, it also takes passion, dedication and persistence to stand up to large insurance companies and obtain the maximum benefits for claimants like you. Dell & Schaefer has what it takes, and we have built our reputation on our willingness to do Whatever It Takes within the bounds of the law to succeed. Wherever you live our lawyers can help you at any stage of a disability insurance claim. 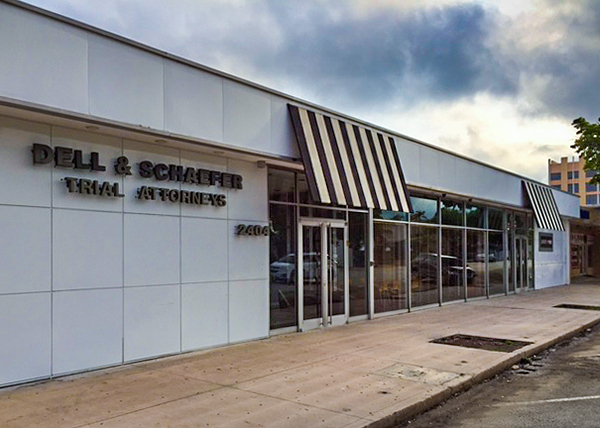 Our 17,000 square foot national headquarters is located at 2404 Hollywood Blvd, Hollywood, FL 33020. Due to our representation of clients nationwide all mail must be sent to our Hollywood, FL office location and all faxes should be sent to 954-922-6864. All general email enquiries should be sent to alexandra@diattorney.com.